Trudy is adding new courses all the time so please check back regularly. Feel free to email any requests. What better gift than a handmade one that you’ve made lovingly with your own two hands. Also, a lovely opportunity for Mother and Daughter to share some quality time together on this special day. 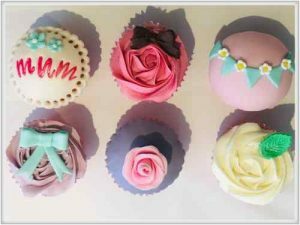 Learn how to decorate 6 Mother’s day themed, freshly baked vanilla cupcakes (supplied). This workshop is perfect for individuals, friends and children over the age of 9. We will be using both vegan ‘Buttercream’, fondant icing and modelling pastes, along with of a variety of professional equipment to decorate your cakes. All ingredients, equipment and aprons are provided. The price includes your 6 freshy decorated cupcakes in a gift box to take home and enjoy! Please email us with any dietary requirements prior to booking. Also, a lovely opportunity for childrens to make a gift for their Dad, Step-Dad or Grandad maybe? 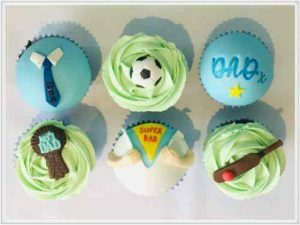 Learn how to decorate 6 Father’s day themed, freshly baked chocolate cupcakes (supplied). This workshop is perfect for individuals, friends and children over the age of 9. Contact Trudy now to find out when the next courses are being held and make your booking!